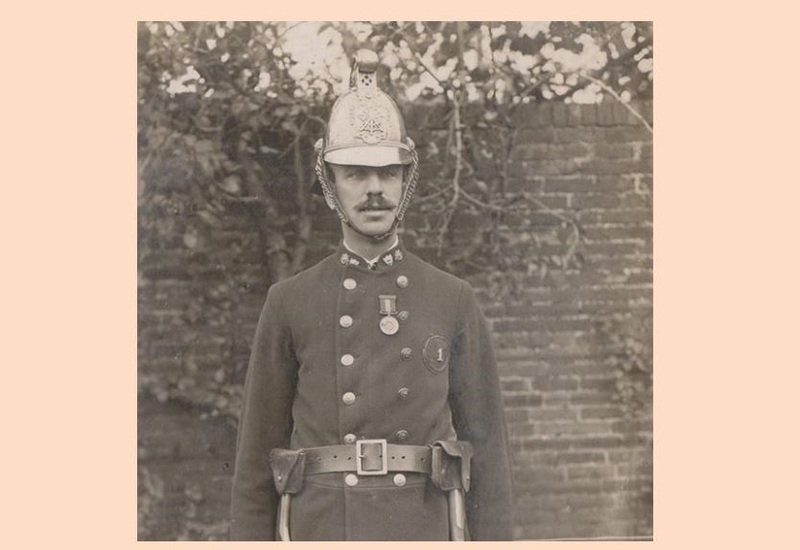 Sydney Percy Scott in the days when he was Newport's 'No.1' fireman. Sydney Percy Scott was born in Newport on 11 January 1882. His parents Mary and Harry (Henry) were both Newportonians with the latter working as a builder. When the Census was taken in 1891 the family were residing at Mary's sisters abode in South Mall Terrace, Carisbrooke. Ten years later they had relocated to Dainhurst on Shide Path and this time Mary's sister Emma was a lodger with them. By then Sydney had followed his father into the building trade and specialised as a plasterer. It is known that at some point over the next decade Sydney joined Newport Volunteer Fire Brigade (which not long after lost the voluntary status) and on 27 February 1911 he married Gertrude Beatrice Lilley who came from Pimlico, London. When the 1911 Census was taken two months later the young couple were living with Gertrude's father George (born in Southampton) at 25 Clarence Road, Newport. Sydney's occupation is listed as builder's foreman. Sydney became a well known building contractor but also spent 17 years as building instructor at Parkhurst prison. During that period he was in charge of the convict labourers that built the prison officer's houses in the Horsebridge Hill area. Sydney's notable lofty dimensions make him immediately identifiable at the centre of the rear row in this image of Newport Fire Brigade, circa 1920. A couple of photographs estimated to have been taken shortly after the First World War show Sydney in brigade uniform (including the one at the top of this page) and evidence that he had progressed to become the brigade's No.1 fireman (this system was generally applied based on seniority of time-served). He was first noted at Deputy Chief Officer, under Chief Officer Mursell, when arriving as officer-in-charge to a fire at Park Place Farm, Carisbrooke, on 13 August 1932. From then his career in the brigade is traceable with some detail through the archives of the Isle of Wight County Press. From these it is also known that Sydney was a keen and active member of Newport's cricket and football clubs and also enjoyed a spot of shooting. In 1928 when Mursell retired Sydney was overlooked for promotion to chief when the General Purposes Committee favoured Captain P.E. Shields, a First World War veteran of commissioned officer status who served on the Council in a senior administrative role. When the workload of the twin roles became too much for Shields he resigned early and on 11 July 1934 Sydney was appointed Newport's Chief Officer. He didn't have long to dwell as two days later a fire in Wootton High Street saw him turn out in that role for the first time. In September the same year the Council, as per the protocol of the time, voted in the chamber regarding the appointment of Sydney's future Second Officer. Both No.1 Fireman Phillips and No.2 Fireman Hurry drew on six votes so the chamber called on Sydney to cast the deciding vote. In choosing the former Sydney reverted to the conformity of the seniority based numbering system that had been ignored in his own case in 1928. Sydney retired from the brigade, aged 57, on 10 May 1939, to be replaced by Stanley Fairbrass. By then one of his and Gertrude's three sons, Hector Percy Scott, was on his way to becoming one of the Island's senior firemen during the trying times of the Second World War. The 1939 Register, taken four months later, evidences Sydney and Gertrude living with Sydney's elder brother Henry at an address given as No.2 Secondary School House. Tragically his firefighting son Hector was to pass away in 1965 and just over a year later, on 28 March 1966, Sydney died at home 2 Medina Avenue aged 84. Rest in peace Chief Officer Scott. 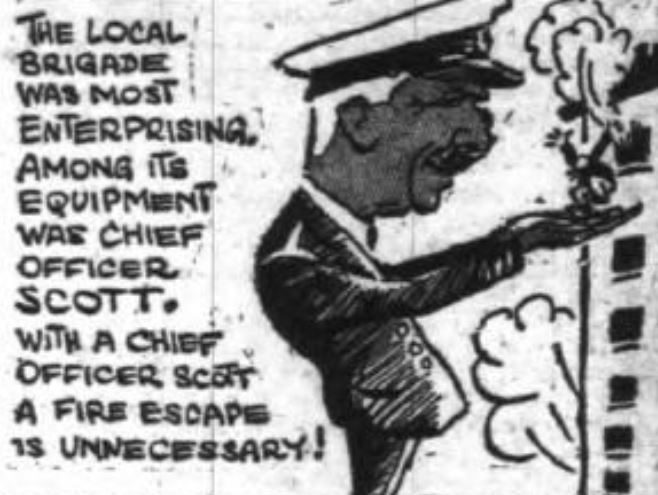 Following the IWFBF drill competition of 31 July 1937, the County Press satirical cartoonist turned his attention to the notable height of Chief Officer Scott.